Wasatia, which means moderation, is the core idea of Mohammed S. Dajani Daoudi’s movement to foster peace and well-being in the Palestinian community. As an idea for a movement, the choice of “moderation” is probably most remarkable in that it seems so unremarkable. In fact, since the French Revolution, there have been a great number of ideas, concepts and catchphrases that have stirred the hearts of people to political and social action – and as far as we know from our research, moderation has never been used successfully to rally multitudes to transforming action. Certainly no professional marketing person would advise such a temperate notion to inspire people. Yet deeper consideration of this idea reveals its deep roots in ancient philosophical and religious thought. Dajani argues that the concept of moderation is literally central to Koranic-based Islamic belief and practice. And every student of philosophy knows that Aristotle placed the concept at the center of his ethical theory over 2300 years ago. This essay explores many similarities of Dajani’s moderation concept with contemporary principles of applied ethics as an effort to reveal the wisdom of moderation and its wide relevance. And though we do not pursue moderation’s intellectual genealogy or reception in Arab thought, it is terrifically interesting to recall that the works of the “philosopher of moderation” were lost to the west after the classical period and introduced to Latin scholars by Arab philosophers in the thirteenth century. It has been Arab scholars who maintained interest in Aristotle from the beginning of Islamic development as shown in the works of two scholars with important influence upon late medieval Christian thought: Avicenna/Sharaf al-Mulk (980 – 1037) and Averroes/Ibn Rushd (1126 – 1198). In any case, Aristotle’s ethical philosophy and his theory of moderation as the “means between the extremes” are worth considering for both drawing out the meaning of Wasatia, and seeing the value of the concept for the Palestinian-Israeli conflict today. Dajani uses the image of big dreams versus small hopes to illustrate the ways that immoderate or more extreme and non-compromising goals are destructive of what Aristotle would call the good of the community. Both Israeli and Palestinian big dreams of total control of the land are contrasted with what Dajani calls the small hopes of more moderate and realistic goals that are much more achievable and realistically sustainable. This is more than a tactic or strategy for Dajani, it is an insight into a mode of ethical action and religious faithfulness which he finds deeply rooted in Muslim Holy Scriptures as well as Palestinian history and cultural traditions. With this goal of moderation, Dajani seeks ways of countering the motivations that lead to less moderate action and animosities. The trip to Poland and the Holocaust memorial at the concentration camp at Auschwitz is just one example of the number of activities undertaken in the pursuit of his goal. It was the first time that Palestinian students went to this concentration camp to understand the role of the suffering of Jews they mostly see as oppressors and perpetrators, not victims. This trip was sponsored by the German Research Foundation (DFG) in the context of a larger research project whereby Israeli students also visit Palestinian refugee camps to encounter the suffering of the Palestinian people as a result of their 1948 Nakba or Catastrophe. The history of the Israeli-Palestinian conflict shows that simple appeals for peace have little persuasive power. Though some individuals may be swayed by particularly good rhetoric, there is little hope that a supremely adroit philosopher, theologian or politician will emerge with the persuasive authority to single-handedly lead a peace movement – though one can hope. But, in the absence of a Mahatma Gandhi, Martin Luther King, Jr., or Nelson Mandela, we can strive to achieve some strategies and principles that help people to move in the direction of more openness to reconciliation and more peace. The argument here is not, we emphasize, that people should choose steps for reconciliation and peace even if those steps are clearly destructive of their own self interests. Rather, the opposite is the case. We focus upon understanding and addressing those “hearts” that seem “hardened” to the extent that they are unable to act in their own best interest, a notion by which we simply mean a group’s self-defined “good”. Thus the approach here deals with interests “pragmatically” – that is, closely related to what is known as philosophical pragmatics following John Dewey. It accepts each groups’ fundamental religious and moral beliefs as a given, and then engages in a process to best realize that group’s interests, as that group defines its interests for itself, within a larger social matrix of diverse groups with diverging interests. Perhaps some examples can help to explain this process. In November of 1947, the UN drafted a plan for partitioning Arab and Jewish states – what would eventually be the states of Palestinian and Israel. This plan was rejected by the Arabs because it was seen as not meeting Arab interests. They argued then that it was a terrible deal for Arabs – and at the time it certainly seemed to be. Yet every subsequent deal offered from 1947 until today has been increasingly worse. If the 1947 plan were on the table today, this would be a terrific deal readily accepted by Palestinians. In 1947 it was seen as an unjust Western and colonial imposition and rejected for reasons that even today can be recognized as having rational merit. A more contemporary example deals with the settlement issue under Israeli occupation. What interests are being served by the Israeli’s continually granting itself permission to development settlements on West Bank land that they have occupied since the 1967 Six-Day War? Further, the brutality of the recurrent asymmetric wars fought against Hamas in Gaza is obviously catastrophic for the people of Gaza. But it also has profound ill-effects on the Israeli people, their economy, their safety, and Israeli identity. There are alternatives to such actions as continual settlement and war that better serve the interests of the Israeli people –as they themselves understand and define them. It may seem directly contradictory for the discipline of ethics to focus so much upon the subjectively determined interests of groups in a conflict. It may also seem contradictory to ask groups to compromise their long-standing principles, to not demand complete redress for historical injustices, or to consent to negotiated settlements that abandon long-cherished goals and dreams. And yet that is exactly what we are arguing is not only an acceptable or rational path, but the most rational and, likewise, the most ethical action to follow. Justice, as it is often understood philosophically and popularly, seemed to make such onerous demands that “justice” had to be simply placed aside. There was no way to punish the whole white population of South Africa for their complicity in the decades of apartheid. A relatively recent approach to justice, “restorative justice”, has been developed and utilized to help guide this difficult reality of post-conflict situations. Restorative justice incorporates the needs of victims and also of the offenders, and it looks to forming and supporting religious, community, and political structures that contribute to social well-being. This understanding of justice has been very successful in helping people come to terms with the theoretical dilemma posed by a wrong-headed concept of justice as somehow an objective thing, a rock-solid value that can be applied to all unfair situations to set them straight. In sum, then, justice is action that leads the community to its best possible flourishing. Not to its perfect flourishing, but to that situation that is better than any alternative situation in the real world. With this concept firm at hand, it is easier to understand the present pragmatic approach as an essentially ethical one. People’s deep interests are essential to their understanding of their wellbeing and flourishing, and are thereby also relevant to justice. Political and military actions that claim to be based upon ethical principles but which lead to continual war are patently contrary to social flourishing and thereby not only unjust in the sense that some academic ethicist will wag their finger. Rather, the judgment of injustice is contained in the situation itself – perpetual war is contrary to social flourishing. With a concept of justice as defined here, a subtle but critical shift is introduced in the very nature of the ethical discussion. Justice is not something like a referee to be called in to provide an objective judgment. Rather justice orders our social actions towards social flourishing. Thus Israeli settlements may be legal or illegal based upon international laws and conventions, but they seem to be clearly unjust because they are so destructive of the rules, agreements and relationships that are essential for Israel’s own flourishing. Every action that destroys Palestinian trust is an action that is ultimately also destructive of Israel‘s own interests. The moderation of Mohammed Dajani’s movement is not just an intellectual idea but also a way of life. Dajani represents moderation in his work on developing pedagogical materials on the Holocaust for Palestinian students in Arabic. And his work to bring Palestinian students to Auschwitz is groundbreaking, or barrier-breaking, in the sense that it was never done before. This trip created an opportunity for a relatively large group of university students and future leaders in the Palestinian community to witness the historical memorial of Jewish suffering at Auschwitz. Aristotle’s concept of practical reasoning, which is essential for the virtue of justice, requires the ability to “see” in the sense of knowing the consequences of actions. The witness of Auschwitz provides these students an ability to “see” not only the history, but also to understand and perhaps empathize with Jewish Israelis in some way. This experience and this seeing and knowing helps in the building of relationships of trust. The moderation of Wasatia is not a magic formula capable of simply instilling an environment of trust on both sides. Wasatia’s mission of teaching important lessons is nevertheless a force of change from within the Palestinian community – one that can benefit from support from outside. How can the moderate path be supported? One way is by utilizing methods of negotiation that have proven success in conflict regions. The Mutual Gains Approach suggests, for example, that bogged down conflict situations can benefit from a trusted third party or mediator. That is a kind of “parachuting” solution from the outside. However, the examples of Gandhi, Mandela and King suggest that real change can be best effected with local or grassroots solutions. This is the insight of Martin Leiner’s Hölderlin Perspective. Outside recognition of and support of local forces for positive change can be beneficial, however. The international community could seriously engage by supporting moderate forces, as well as removing support and alienating resources from groups that intensify conflict. Wasatia is clearly a moderate force and its message of minimal but realistic hopes is a very deep and ultimately effective force for change. 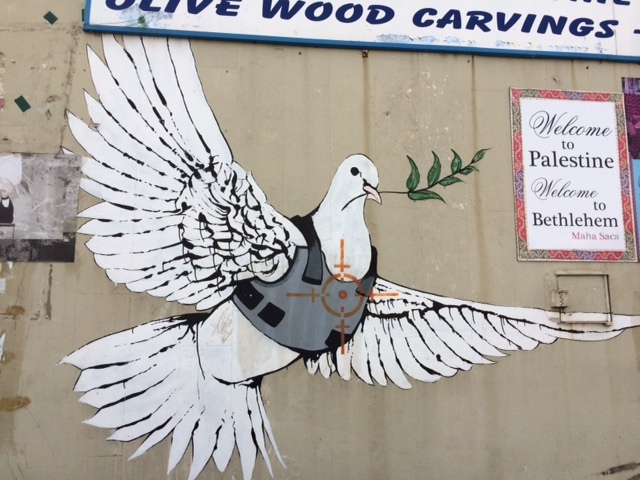 Support for small hopes can bring immense potential gains from peace and reconciliation for the Palestinians, Israelis, the Middle East and globally. Moderation (Wasatia) offers a vision of ethical action based upon Muslim teaching and traditions that has much to offer not only the Palestinian people. As Aristotle argues that the mean between extremes for human action cannot be expressed in a simple mathematical formula, Dajani’s work integrates the dynamics of human experience into his work. Palestinian students need to know their “other” – Jewish Israelis. This requires understanding where they come from and why they act. 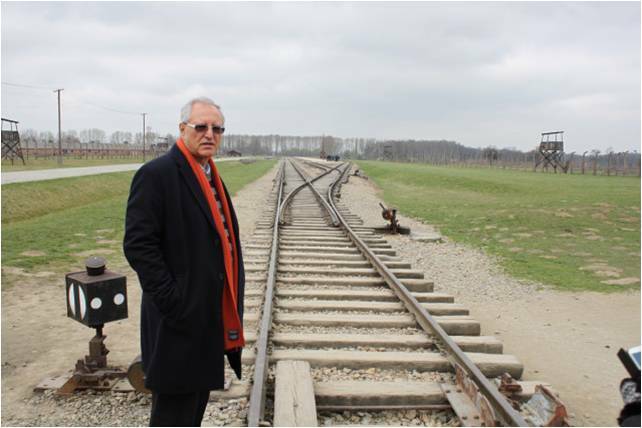 Given that the Holocaust is such a central event of contemporary Israeli Jews, witnessing the memorial at Auschwitz provides an opportunity to build knowledge through empathy by “experiencing their suffering”. Whatever political alternatives emerge in the hopefully near future, the path of moderation is one that will serve the Palestinians well to best achieve their own best interests. Perhaps the solution will have two separate states, or even some form of single state. Whatever the solution, both sides will benefit as far as they have the capacity and thus strength to act with moderation. With an agreement to work together, there is an enormous amount of value that they can realize – they could be an example for the rest of the Middle East and the whole world. This seems utopic at the moment. Too much hatred has filled too many hearts on all sides, hardening them not only to reconciliation, but also to paths that could best lead to their own flourishing. Wasatia is doing important work in understanding how these hearts of stone can change to hearts of flesh. We welcome your comments: conntect with us. This entry was posted in Negotiation, conflict resolution & good decision-making, News. Bookmark the permalink.